Lights! Camera! Action! The Teen Titans blast onto the big screen in Teen Titans GO! to the Movies starring the animated team of Super Heroes famous for their antics, as well as their actions. Coming to the realization that the Teen Titans are surrounded by superheroes super enough to star in their own movies, Robin’s baby hands get busy making a star out of the popular sidekick. Don't miss a moment of excitement as Teen Titans GO! to the Movies - Super Heroes with Super Beats. Drop the beat to the Lil Yachty remix, y'all (in my Beast Boy voice)! Thank you to The MOMS Network for hosting a Mamarazzi exclusive media screening of Teen Titans GO! to the Movies with Will Arnett for editorial content purposes. Hollywood comes alive with poppin’ music and total mayhem when the Teen Titans encounter none other than an actual evil Super Villain. Keeping the team in teamwork is the only way the Teen Titans will be able to save the day. 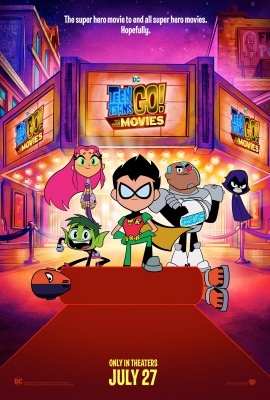 Check out the official Teen Titans GO! to the Movies music video featuring Lil Yachty. Will Arnett (The LEGO® Batman Movie) and Kristen Bell (Frozen) are among the cast of super talents appearing in the first-ever big-screen version of DC Entertainment and Cartoon Network’s animated Teen Titans GO!, animated TV show, also starring Greg Cipes (TV’s Teenage Mutant Ninja Turtles) as Beast Boy, Scott Menville (TV’s Spider-Man) as Robin, Khary Payton (The Walking Dead) as Cyborg, Tara Strong (the My Little Pony franchise) as Raven, and Hynden Walch (TV’s Adventure Time with Finn & Jake) as Starfire, known for their character roles in the animated series. We loved every minute of the movie with plenty of earcandy songs to keep the family bouncing. We're already making plans to see Teen Titans GO! to the movies a second time and without a doubt , we'll be adding this movie to our expanding home collection of faves. Catch all of the action when Teen Titans GO! to the movies opens in movie theaters July 27th, distributed worldwide by Warner Bros. Pictures.